Stratos Filalithis, the acting head for the University Website Programme at the University of Edinburgh, attended his first IWMW event in 2014 – and discovered “a community to share and discuss ideas, meet people and look at things from a different perspective“. Any 20th year anniversary is significant, let alone celebrating the event bringing together UK’s higher educational web management community. I must admit I am quite a newcomer in these events, having attended only at Northumbria University in 2014, but have followed closely since 2013, the year I joined the University of Edinburgh as a humble Web CMS support officer. Having moved to greater things, initially to the role of the University website service manager, leading a team of 4 developers, and then acting up to the head of the Website & Communications section, a team of 15 people which manages a service of more than 300 websites and 50,000 published web pages, maintained by a devolved community of more than 700 trained web editors, allowed me to have different levels of exposure to the same challenges, main one being the overall management through an ever-changing environment, as technology and the web is. When I first joined the University on January 2013, and by not having any previous experience working in higher education, I started realising how weird everything is. Everyone part of the same organisation but, more often than not, living in their own business unit silos. A huge devolved web community that had to adhere to centrally established strategy and follow guidance, but at the same time having a need to address local needs and requirements. An ever-developing central University website and management tool trying to address these issues, and a good number of business unit websites trying to achieve very similar objectives. 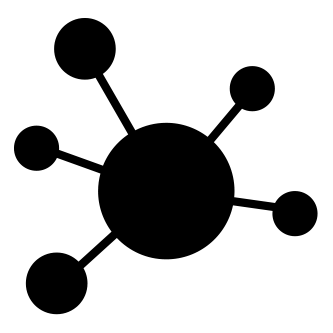 Web teams here, there, everywhere. As I said, how weird. It took me some time to start figuring out everything. Enter IWMW. My colleagues recommended the event and the immediate gain was the realisation of “Phew, we ‘re not alone!”. Attending the 2014 event was definitely an eye-opener as, except the usual networking, there was a true opportunity to understand how similar challenges could be addressed by different approaches. Furthermore, confirm once more that change is an element that has to be addressed constantly, being the rule and not the exception in web governance and management. Ross Ferguson’s talk around digital service management really stood out. You can read all about it in the guest post on “Reflections on IWMW 2014 from the University of Edinburgh” published on the UK Web Focus blog. Digital is here. It actually had been here for quite some time, but the true realisation of its impact is happening every day. The good news is that more people, especially ones being less technical and in senior roles, make the exact same realisation and can help advocate change from the top. It’s always exciting times to be working around the web, more challenging doing it in a higher education environment. Thankfully, there is a community to share and discuss ideas, meet people and look at things from a different perspective. Stratos Filalithis is the acting head for the University Website Programme at the University of Edinburgh, supporting the University’s key strategic goals, while still overseeing the management and support of the University’s corporate Web Content Management System, EdWeb and other high-level University online services. 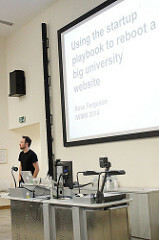 Image credits: Image of Ross Ferguson at IWMW 2014 and participants in lecture theatre at IWMW 2014 from Netskills Flickr account. Used under a CC-BY licence.